It never does get any easier. But sometimes, it goes as well as it can. This shouldn’t have surprised me, Belle being who and what she’s always been–utterly focused on being perfect. In the middle of March, I learned of Belle’s illness and wrote her a bucket list blog. What I didn’t anticipate was how well she’d respond to the new management. At the time I wrote the blog, I thought we’d have a week with her–the changes had been coming so quickly even between the time of calling to make her vet appointment and taking her in, it seemed pretty inevitable. But she did really well on the new mealtime protocol, and even better on the new supplement. She luxuriated in her new access to the Forbidden Tripping Zones (AKA, “Sleep under mommy’s feet”) and what had been a rising edge of anxiety turned gentle. She spent her mornings in the spring sun and her afternoons with me in the office. Evenings she shared with the Beagles here in the office. 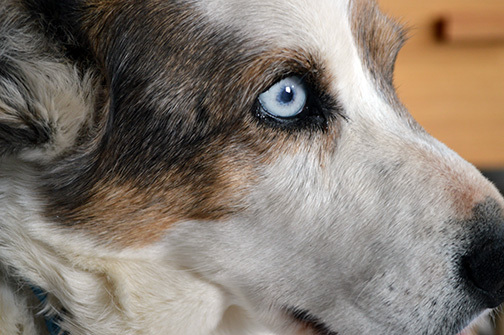 It worked for me, too–quiet final days with my best princess girl. Good days. The only thing that truly bothered me was that I wasn’t…well, all teary-eyed and stuff. Instead I kept smiling at her, and absorbing her presence, and enjoying her. Didn’t seem quite right. In the end, we got two weeks. Each day presented subtle new changes, but nothing she found distressing. 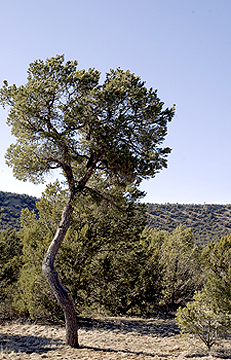 First she stopped losing weight, and then she gained back what she’d lost in the first place. For a couple of days, she seemed to be holding ground. But really, she wasn’t. And then there came a day when I knew it was close, and the next day I ambled out into the kitchen to feed her breakfast and she looked at me from her crate, and I burst into all the tears I’d been hiding. So I knew, in the way that the heart does. 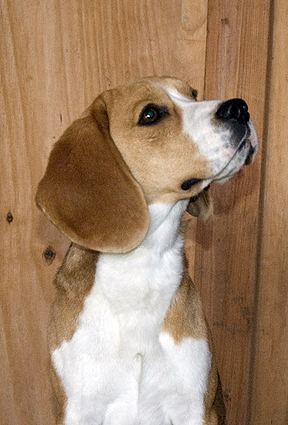 After that I had to pull apart the pieces of the decision and second guess myself, but it turned out that everything still fit together, and after a morning of kisses from family and a chance to sleep out in the sun with her boy Beagles one more time, Belle’s Auntie Vet came to visit us and Belle quickly and quietly slipped away. Good girl, BelleBelle. Still perfect, after all that. One last sunny snooze. Might not get any better than that. I’d thought that I’d write a blog this weekend, and I’d thought it would probably be about Dart’s first agility trial in four months. It’s Belle Cardigan’s blog instead. 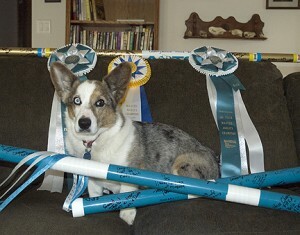 Miss Belle and one of her agility prizes...can't see, can't hear...but she can still smell the treats! Belle is now just past thirteen years old, and we’re suddenly–very suddenly–getting ready to say good-bye. She’s seen a lot of changes in the past year; she’s now mostly blind and profoundly deaf, and I thought that explained some of the new behaviors that have crept in over the past couple of months. And maybe to some extent, it did. But suddenly other changes piled on in the course of the last week, and a visit to the vet quickly revealed the worst–the cancer that Belle has been hiding from us. Never mind her gorgeous coat or the fact that she looked so good on her Christmas Eve birthday that I thought I’d have years more with her. 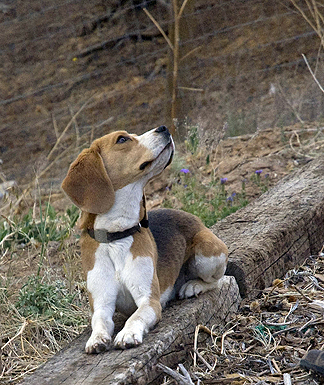 Belle was a gift from writer/breeder friend Jennifer Roberson at Cheysuli Kennels, way back when I first moved to the Southwest. 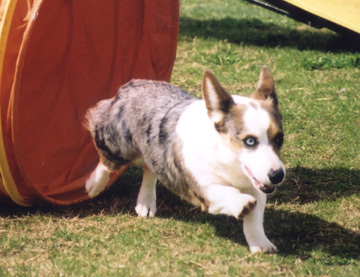 She was too small for conformation shows, but she grew into my first serious agility dog, and she marched through rally excellent and novice obedience with a steady stream of blue ribbons. She was the first dog in this area to get a PAX (and that was the first PAX title that judge had given). She was one of only 50 dogs to have a PAX2 at the time she earned hers. When (in July of ’12) AKC instituted the more demanding PACH title, she earned her first PACH and very nearly her second; she was at that time #2 Lifetime Preferred Cardigan Corgi. When I retired her at the end of last year at the age of twelve, she was 100 speed points away from that PACH2 (and nearly a PACH3 with her double Qs). Belle is my princess dog. My tries so hard to be perfect you want to cry dog. My sweet, sweet little blue merle girl with the blue eye. Bellicious, Bellevator, BelleBelle, Miss B, Princess Belle. I’m not sure how long we have. I know it’s not long enough. And so I am making a bucket list for her, the things I think she most wants from her world in these scant remaining days. Pleasant afternoons of snoozing in the sun. Evenings of snoozing in the forbidden “trip me” spot RIGHT BESIDE MY FEET at the standing station. Nomming down extra coconut oil, fish oil, and big heapings of yummy meats. Her appetite is still fine, and she needs this tripled intake to maintain her otherwise rapidly falling weight. Getting the office princess bed whenever she wants it, no matter who the boys think owns it (or what they think it’s called). Not worrying about piddling indoors because the office is now one giant incontinence pad. Playtime with the mommy on the floor gently pinching her toes so she can pretend to FIERCELY BITE. I Stepped in WHAT, now? It’s been an interesting Weekend with Dogs. 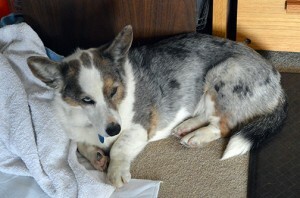 Belle Cardigan Corgi: i don’t think you have to tell this story. No, really, I do. It’s part of the whole weekend. Belle: i will pretend i am not here. Here. Just hide over here in your Princess Bed. Probably for the best. The past weekend is proof positive: to live with dogs, you have to live humble. And be ready to laugh. It also has a freaking lot of uncontrolled off-leash dogs, but that’s a rant for another day. Well, as we said at the time: we weren’t hot any longer! Connery took his turn to bravely handle a freaking off-leash dog and overcome his concerns to return to his track, and then Dart ran. For the past couple of sessions, Dart’s been struggling with the notion of tracking extensive hard surfaces–especially when it comes to concrete, which holds less scent than asphalt. It’s been obvious from his reaction to these surfaces that the scenting experience is so different that he doesn’t consider tracking over it to be the same task. This time out, I deliberately laid a track that was mostly asphalt and concrete, with transitions from one to the other–including stairs. (Scent behavior on stairs is pretty outrageous, never mind concrete stairs.) On another dog, this might not have been a good choice, but with this dog…evil genius that he is…there have been too many times I’ve presented him with a giant leap of performance criteria only to see the whole thing click in his head. And there was celebrating by all! Good boy Dart! Belle: maybe she will forget about…well, nevermind. The cuteness factor here is far too great weapon to use casually, so it didn't make the cut for cover. But honestly--! 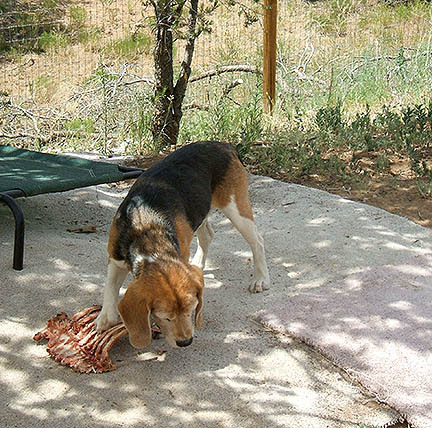 While Dart was drying, a fellow raw feeder came by with sheep bones that she couldn’t use. It turned out to be a sheep skeleton, which fits into freezer space somewhat differently than a bundle of bones–it’s an interesting visual–but it was all very much appreciated. Especially by the dogs, who will be exercising their jaws and flossing their teeth for some time to come. Sheep bones come in handy another way, too, it turns out. Door-to-door steak-selling Guy: Buy my stuff! 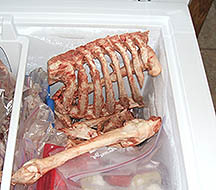 Me: Oh, so sorry…I just put a sheep skeleton in the freezers. No room! Belle: she really did forget! So, after this dogventure filled day, I was looking forward to a good night’s sleep. Belle: oh. she didn’t forget. Dart often wakes up during the night–half the time he’s fretting, the other half of the time he really has to go. So the first wake-up call is always treated as valid, and I generally handle this without lights, without glasses…if I can help myself, without opening my eyes. Belle: maybe it is all dart’s fault. 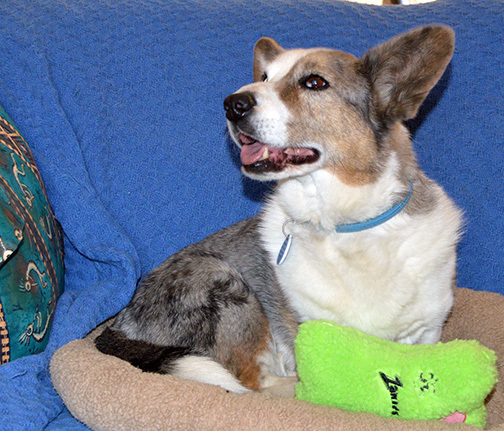 Belle is the only one of the dogs who isn’t crated at night–she’s a bedroom dog. (Connery’s crate bedding routine helps to control his allergies; Dart’s crate helps to control…Dart.) Last night that bedroom door was open, due to the heat and need for circulation, but she’s a very good girl, so…no big deal. Belle: it happens to everyone now and then! Me, a little more awake now: That can’t be right. Let’s just say I turned on the light. Pets. Never a dull moment, eh? I’ve never been any good at competition. Doing well means too much; it always has. I’m one of those people who hands homework in early, stressed myself sick over tests all the way through college, ran my years of track plagued by moments of Fail though Trying Too Hard, and always aim to deliver my books early. So when I started pondering obedience trials with my first Cardigan Welsh Corgi, it wasn’t a natural fit. I forgot to breathe, my legs were too wobbly to move confidently, and my clever dog knew better than to think we were having fun. Very early in that effort, a gruff steward followed me out of the ring to berate me harshly in front of all and sundry for a newbie error. I went off to cry and that was essentially the end of my obedience trialing. Flash forward a couple years. I was training brain-injured Jean-Luc Picardigan in agility as therapy. No one expected him to function well enough to compete, but that wasn’t the point, and we were happy. Then I started Belle Cardigan in classes about six months later just because she loved it. Six months after that, I entered them both in a small trial, somewhat against my better judgment. Not because of my concerns about them, but because of me. I knew me. And, in fact, Jean-Luc took one look at the unfamiliar start line and went into his autistic mode, freezing in place until I went to get him—unable to process the sensory input of the situation. But that was okay. We were there to enlarge his world, not break competition records. And then Belle started to run. Suddenly it was me and her on the course together, alone—and we were flying. I came off that course a different person. One who knows it’s not about being perfect (even when perfection is nice). It’s about those moments of connection with the dog. It’s about flying together. Jean-Luc has passed, but the agility changed his life in ways I can’t even describe. 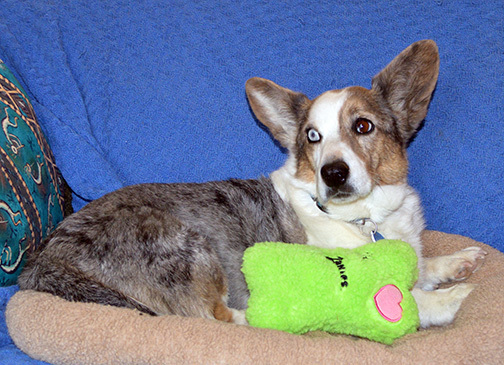 Belle is freshly retired, 100 points away from her second PACH and, at the time, #1 Lifetime Preferred Corgi. Oh, we could have eked out those final points. But she’d become concerned over her own diminishing speed. We weren’t flying together anymore—not truly. We were just worrying together, and that’s not what this is for. Now it’s two more dogs (and a breed) later, not to mention two (almost three) MACHs later, and a handful of other titles (including that obedience title, albeit with a different dog), with young Dart just starting his journey. 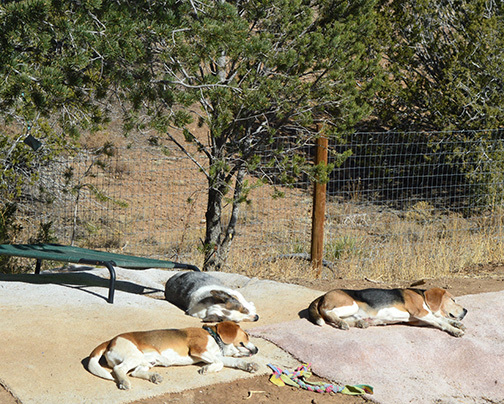 We’re also into tracking now, and ConneryBeagle is flirting with cat search and rescue—and we’re all enjoying the zen of it. 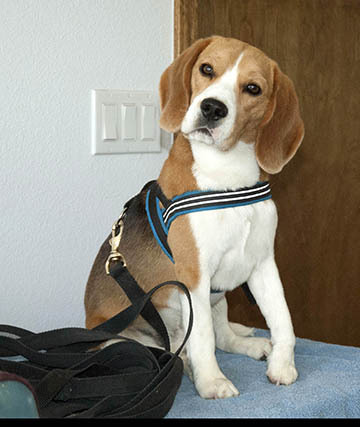 And if Dart Beagle is a little crazy and well-deserving of his Crytic Evil designation, those moments when we do connect on course and on the tracking line and in the obedience ring…well. Those are out of orbit. And changing the way I think about that is what makes it possible for that to be what it’s all about—for both me and the dogs. We still aim to be perfect. But we also take it on the fly, just being together. PS But leave me my book deadline anxiety—and don’t ask me how far out from this Dog Writing event I had this blog written! 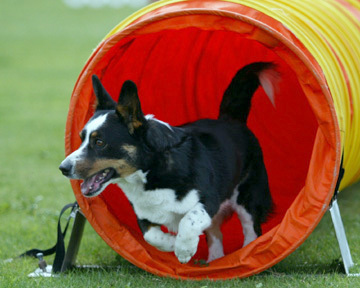 PPS Other blogs on this subject are linked at the Dog Agility Blog Events. In training, I do my best when I’m in the middle of it, but find it all to easy to look back after I’ve done it. It’s the If Only game. I bet you’re familiar with it. …I had realized sooner how to meet this individual dog’s needs. Sometimes this way lies madness. 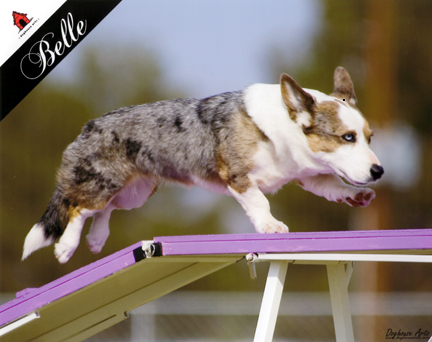 While I didn’t start agility with any particular training philosophy, I did do something else–I started with Jean-Luc Picardigan, an autistic, brain-injured young Cardigan Corgi. In truth, none of the usual techniques worked for him–just a lot of guidance, a lot of repetition, a lot of patience. 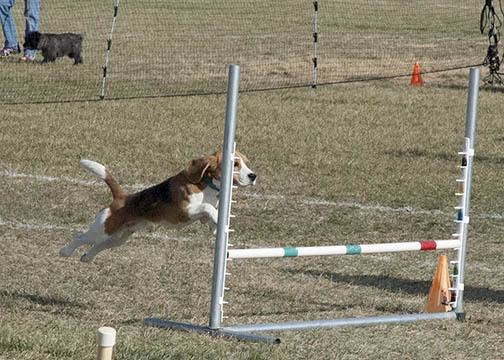 Eventually agility changed Jean-Luc’s life and he earned multiple (unexpected!) titles. But that’s another story. The point is, when I started training Belle (AKA Miss Belle AKA Princess Belle AKA b-b-b-BELLE! 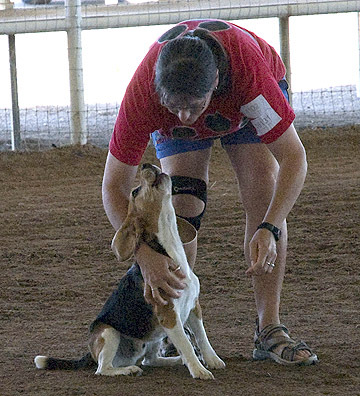 ), my sole experience with training for competition dog sports was based on this brain-injured boy. So training Belle–who was a natural, full of glee and amazingly fast to learn–came very easily. What I didn’t realize–what eventually became our major struggle–was how very, very sensitive and soft she is to the unspoken and the incidental, and how things to which she gave no real-time reaction (such as someone shouting to someone else across the agility training field during drills or class) added up to make a significant impact on her. For in contrast to Jean-Luc–who was largely oblivious to all forms of communication until agility and even afterward required specific, direct (and unique) management, Belle assumes that all communication is directed at her. And she takes on the worries of the world in the process. Belle: Am I a good girl? Are you sure I’m a good girl? Someone raised her voice five five minutes ago. I don’t believe you. And you’d better believe she knew it when I was frustrated during training, even if I happened to be frustrated at the weather, another dog’s interference, or a stone in my shoe. So even though I was working with a “it’s the handler’s fault” philosophy when mistakes happened, Belle’s extraordinary sensitivity–and her need to be perfect–meant that wasn’t enough in the long run. Not that she didn’t accomplish awesomeness along the way. 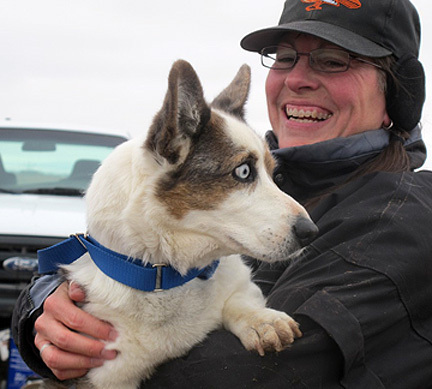 She was the 20th dog to earn a PACH nationwide. 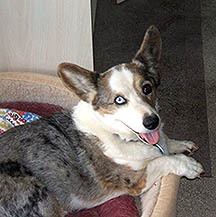 She’s a PAX2 dog who retired at twelve years old and 100 speed points shy of PACH2, and at that time she was #1 Preferred Corgi. And this in spite of being out of the game more than she was in it, between her health and mine (that, too, is another story). …I had understood the profoundly unexpected way Belle absorbs the weight of the world. Doesn’t sound like a life philosophy, does it? Here’s the thing. 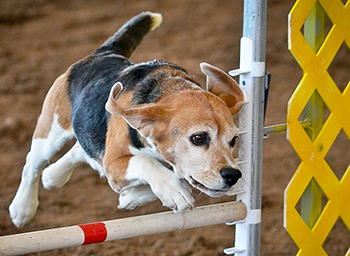 In agility, there are contact obstacles (A-Frame, Dogwalk, Teeter…). 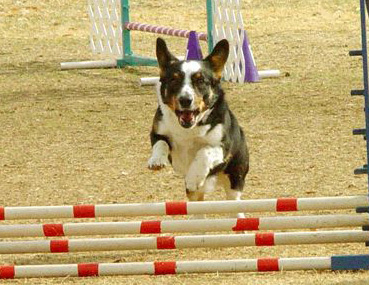 And there are safety-oriented performance criteria for these obstacles: The dog has to put at least one foot in the yellow section. The teeter must hit the ground before the dog departs it. Here’s the other thing: Lots and lots of dogs love to leap from the top of the A-Frame, the teeter in mid-air, the dogwalk from some point that’s excruciatingly close to the yellow but not actually in it. So we have lots of training methods to teach the dog to run into the yellow. Touch pads, stride regulators, targets, and cookies and…. I don’t treat my dogs on the contacts. They’re Beagles. Do I need to encourage them to turn the dog walk into a slow sniffing exercise? No, I do not. I taught them to crawl, which is a diagonal movement and prepares them to collect on the downslope while avoiding the cantering gait (lateral gait) that makes LEAPING so inviting. (I don’t know anyone else who does this. I’m sure people are pointing and laughing at this blog). On the teeter the boys have different behaviors suited to their personalities, but really, that’s not the point. 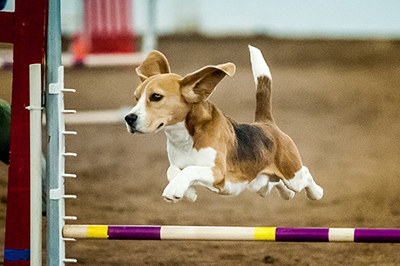 There are so many ways to train these criteria, and different ways suit different dogs. That makes no one way THE RIGHT way. BUT. 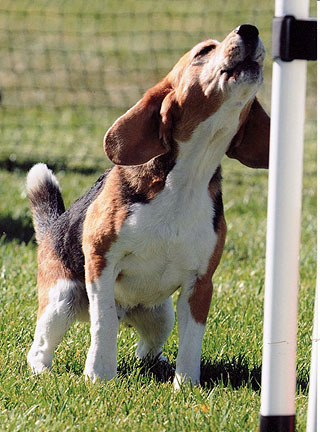 If your way is to use a treat at the end of a contact, and you do that by squeezing fake liquid cheese (yum) onto the end of the obstacle at a training yard that many dogs use, then IT IS THE WRONG WAY. Because what do you think happens to my dog when he encounters your cheese molecules? Yes, thank you very much. It untrains him at the same time that it gives him exactly the idea I don’t want him to have: that obstacles should not be performed, they should be inspected for food. 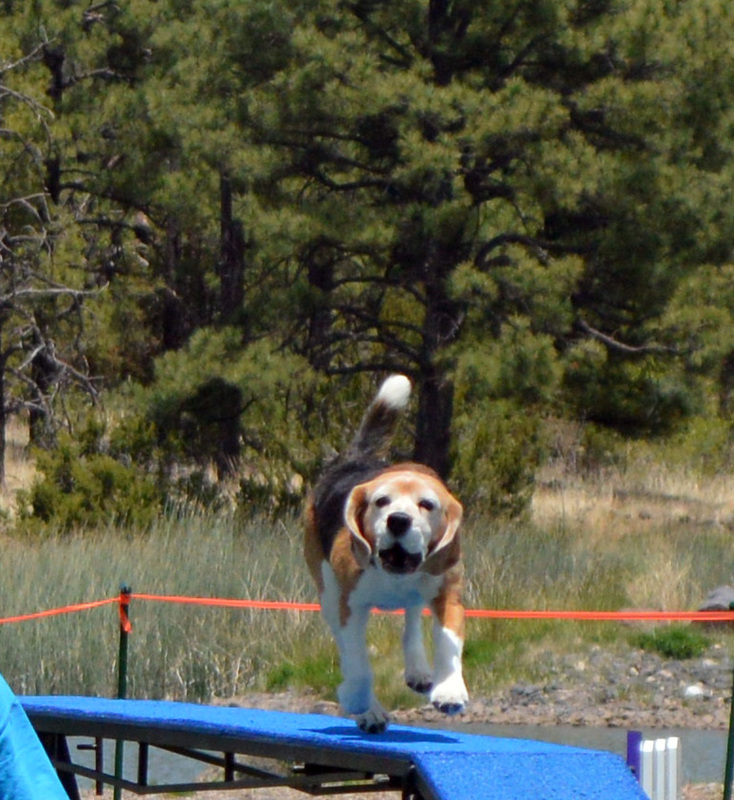 Recently Dart Beagle ended up in a cartwheel because his front end found leftover cheese while his back end was still performing the obstacle. Thank you, no. Do Not Want. Still waiting for the life philosophy part? Here’s another way to put it, much older and maybe somewhat hokey these days–it’s called the Golden Rule. Do unto others, people. Yea, verily, as you would have done unto you. PS there will be no photos of cartwheels, as I will make sure it never happens again! 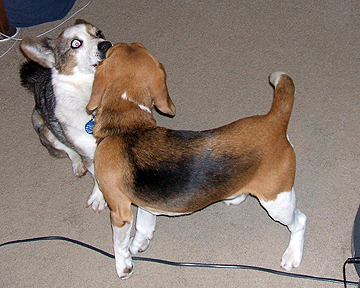 But here is a moment of Belle about to tell Dart Beagle that he’d better sit still for a face-cleaning. This time I did not fix her evil blue flash eye!